This puppy and kitty are best friends! Another contest entry for My favorite Things, Rainbow Challenge. 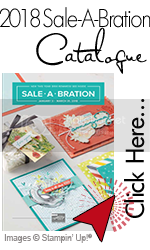 One of my favorite events is Crop and Create put on by Scrapbook and Cards Today magazine. I attend in Cornwall and Toronto. Last weekend, I attended the Crop and Create Cornwall and one of the all attendance giveaways was the stamp set and matching dies Meow Mix by MFT. I adore this set! 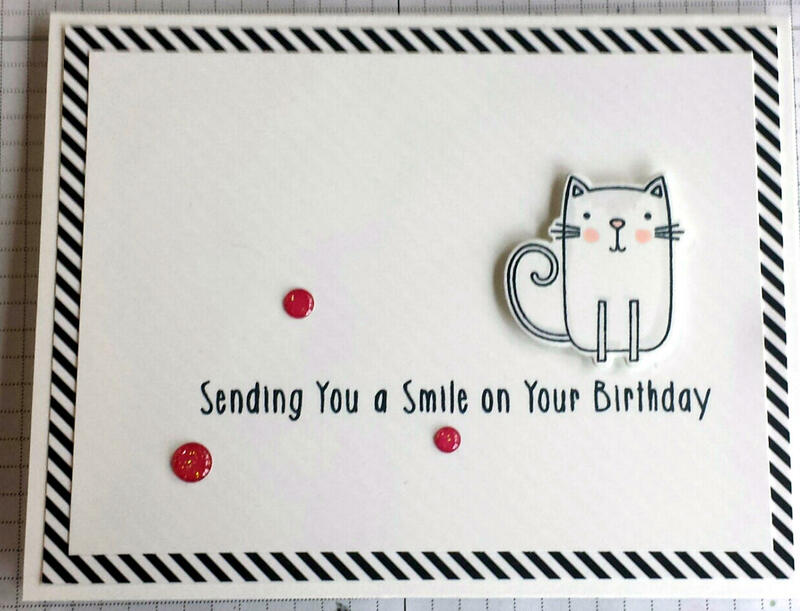 I created this card for a clean and simple challenge. Here is a card I designed for World Card Making Day using product from My Favorite Things. 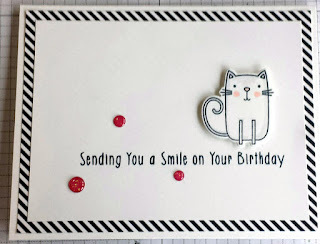 I used the stamp set Meow Mix (that we all got at the Crop and Create event in Cornwall). I love new product release day! 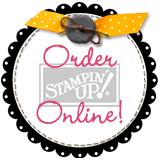 I stayed up til midnight to put in my Lawn Fawn new product order from Scrap 'n Stamp and the next day I found out I WON all 11 new stamp sets direct from Lawn Fawn. 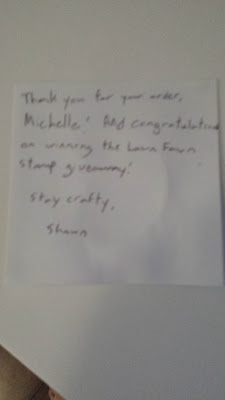 So, I called Scrap 'n Stamp to see if they could change 2 of my items as I had won them for FREE. and they did! That is great customer service. So now I have all the dies waiting for their stamp partners. *sigh. waiting is hard. I want to create! I have ordered from Scrap'n Stamp a few times now, and every time they send a hand written note thanking me for my order, but this time the note was extra special and personal, as Shawn congratulated me for winning the Lawn Fawn release. Personal touches! Thanks for looking, and nest time I will have a new creation to share! 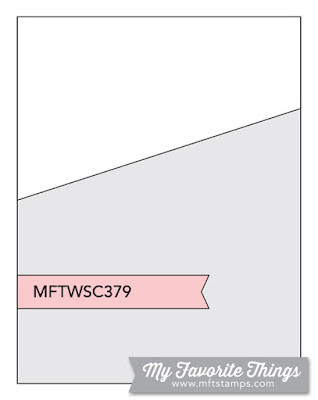 One thing I love about MFT (My favorite Things) word dies, is they come attached together so you don't have to fuss about for even placement, BUT they cut out individual letters! It is like getting 2 dies in 1! 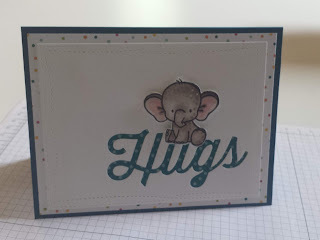 I used the script hugs from the die set Twice the Hugs to cut the word out of white card stock, then I adhered patterned paper from MFT behind it. 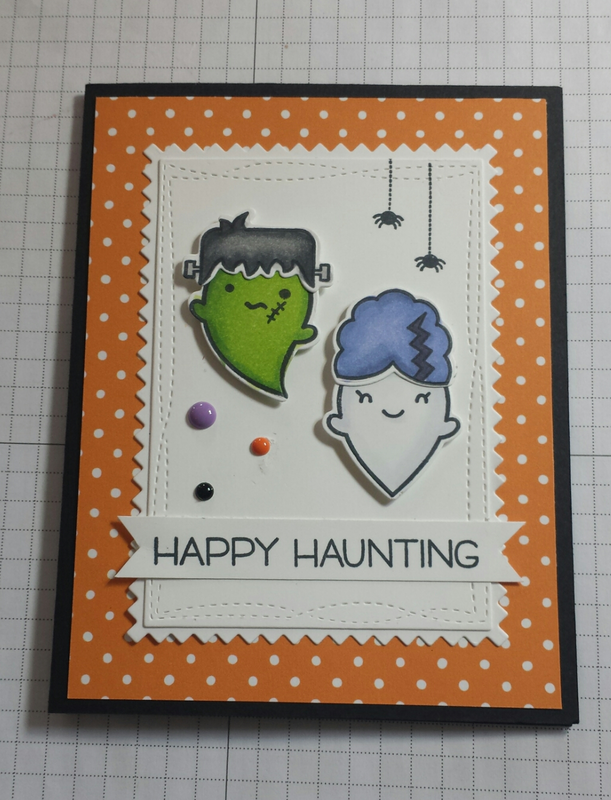 I also used wonky rectangle die to add interest around the edges. 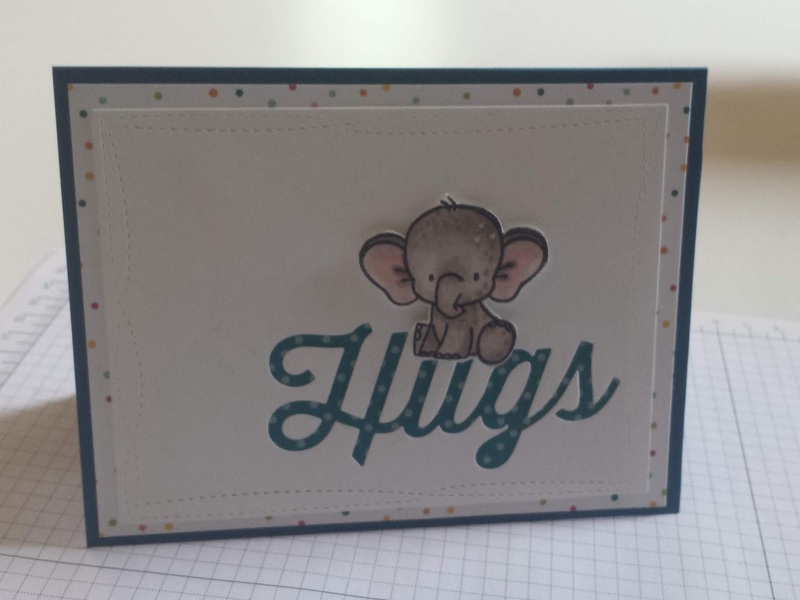 The first card I used the elephant from Tons of Fun and Copic markers to colour. The second card I used the otter from I Otterly Love You. I think this mom and baby are adorable! A little close up. 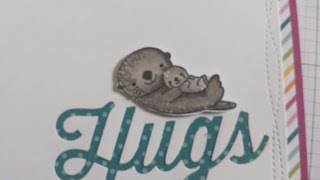 As you can see, I used white gel pen to add just a bit of white dots on the otters. 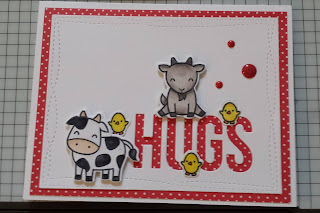 I am just in love with these farm animals from Hay There by Lawn Fawn. They do take a bit to colour in, but they are so cute! 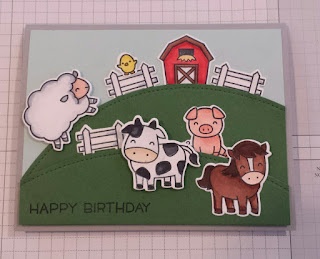 So with the first card, I used 5 different animals from the farm to wish a Happy Birthday...from the whole herd! 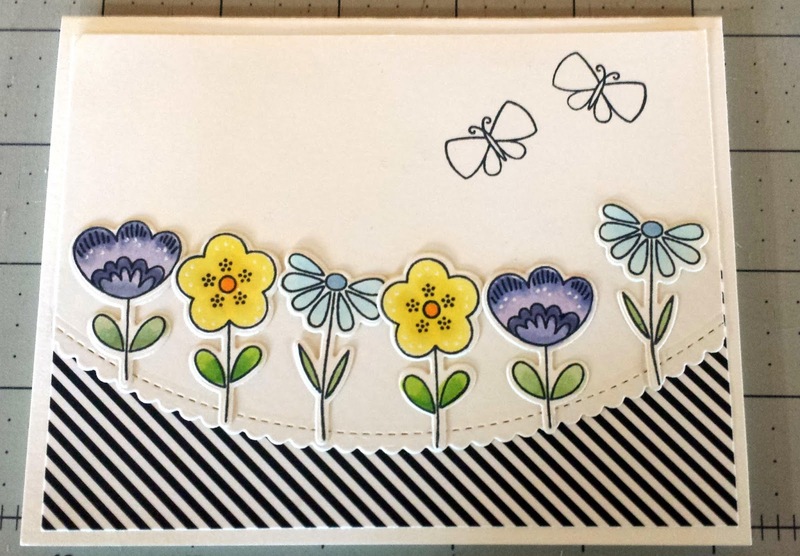 This second card uses the Wonky stiched rectangle from My Favorite Things, and patterend paper from Lawn Fawn. I added some enamel dots to fill in that space a bit. The word HUGS was die cut with a die from My Favorite Things. I used Copic markers to colour everything. 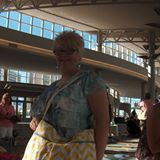 So I stumbled upon a contest hosted by My Favorite Things, and having just purchased some MFT product, I decided I would try it out! It is a sketch challenge, and I love those. The card stock and ink I used are from SU, the sprinkles are from 28 Lilac Lane, and I used Copic markers to colour her, but everything else is from My Favorite Things! I am enjoying playing with my new Lawn Fawn stamps. Tonight I am using Beam Me Up and coordinating dies. 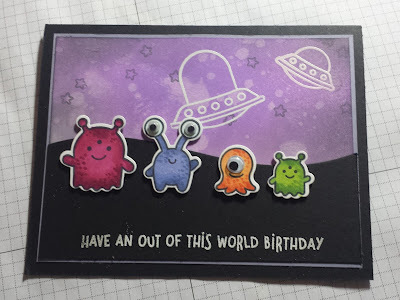 I created my alien sky using Wilted Violet and Black Soot distress oxides. Then I sprinkled a bit of water and blotted it off to create some texture. I stamped stars in black. 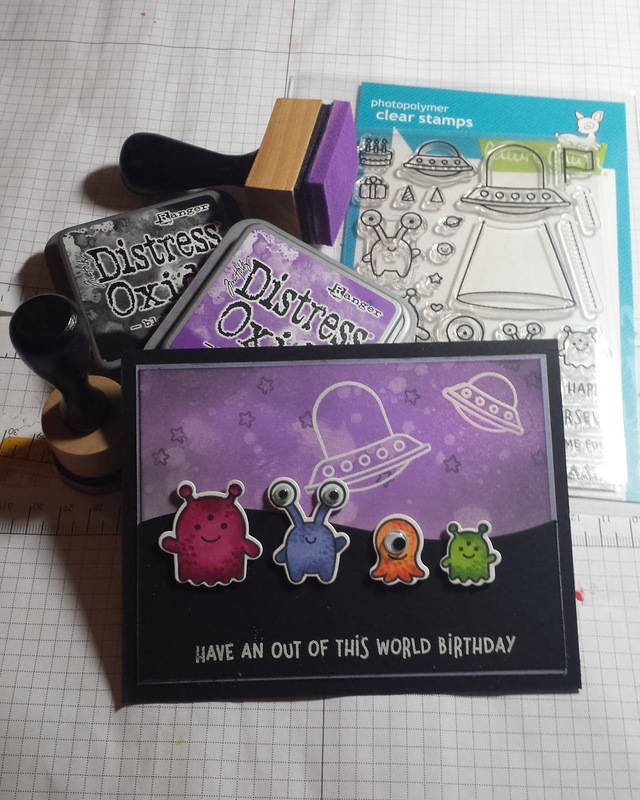 I embossed the saucers with white embossing powder. I coloured my aliens with my Copic markers, then cut them out with the coordinating dies. 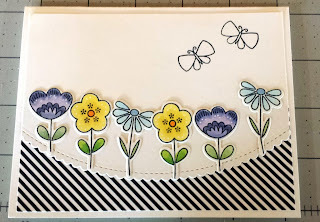 I used my stitched hillside border to cut the black piece. I embossed the sentiment with white powder. 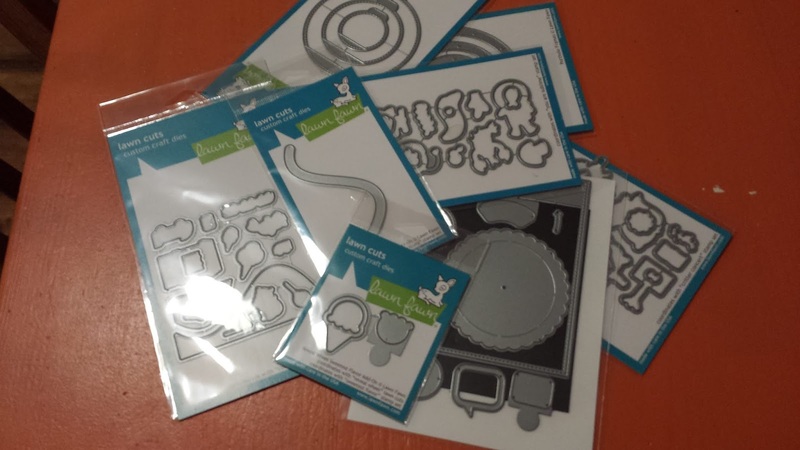 Then I assembled all my pieces to my card base. Once that was completed, I played around with my aliens until I had them where I wanted, and used dimensional foam to pop them up. I thought they needed googly eyes. 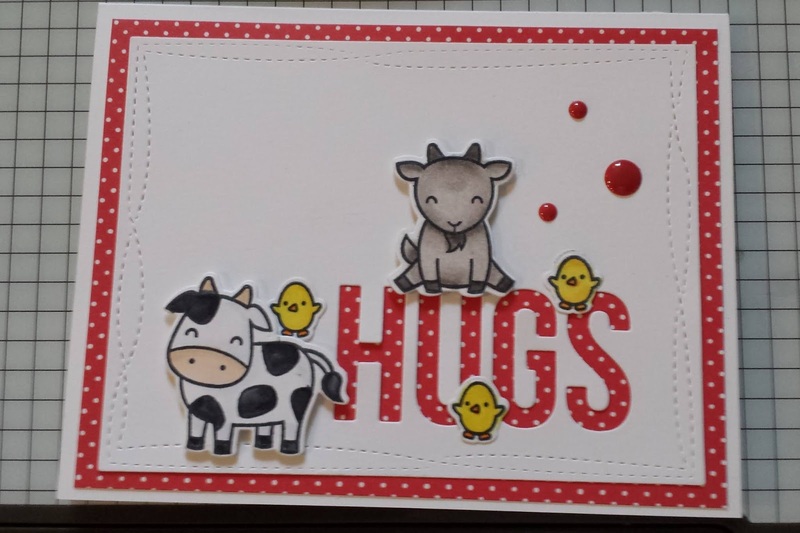 so I added those using glue dots. Thanks for stopping by! Yes, it is completely out of season, but I just HAD to play with these guys from lawn Fawn. 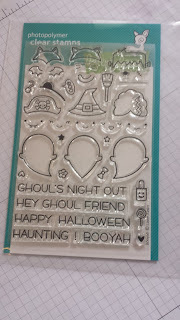 The set is called Booya and it has 3 ghosts that you can dress up in many different costumes! 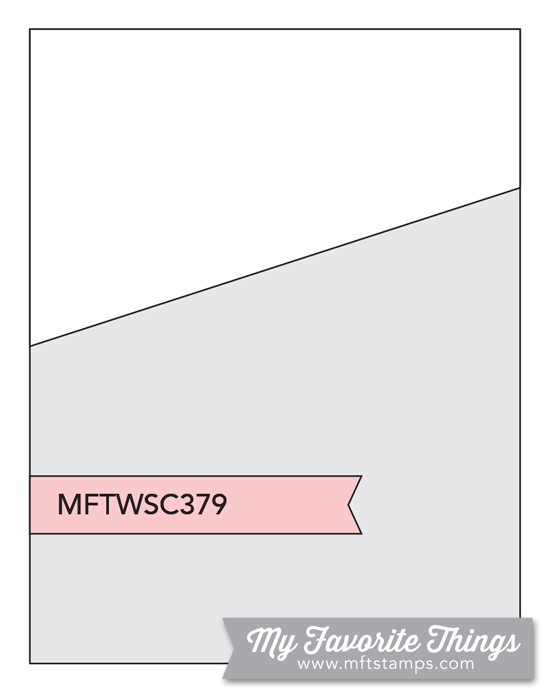 I purchased the matching deis as well, so cutting out each individual tiny element is easy! I used my Copic markers to colour in these ghouls and it has been quite some time since I coloured! I am quite pleased with my effort. I think these ghosts will be used quite a lot come Halloween! 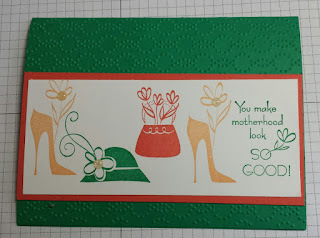 You Make Motherhood Look Good! Peekaboo Peach, Emerald Envy. This was a struggle for me as I don't really use Peekaboo Peach ever, but I played along. 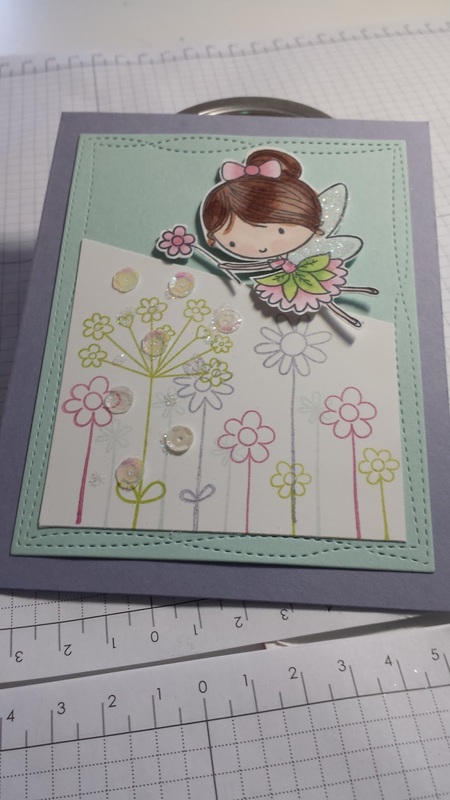 I created a mother's Day card using A Mother's Flair from the Occasions catalogue. I embossed the background to add some texture, and I added some glitter enamel dots to fancy it up a bit. 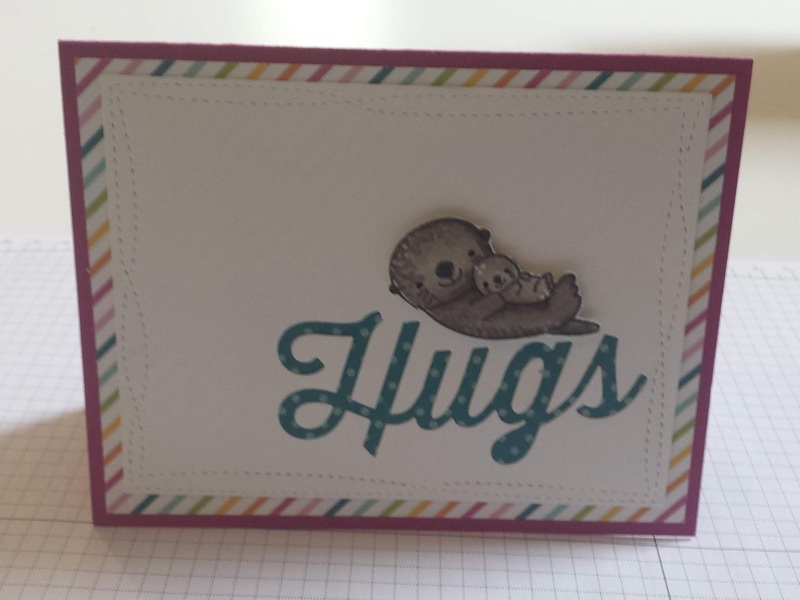 I really love the sentiment on this card. 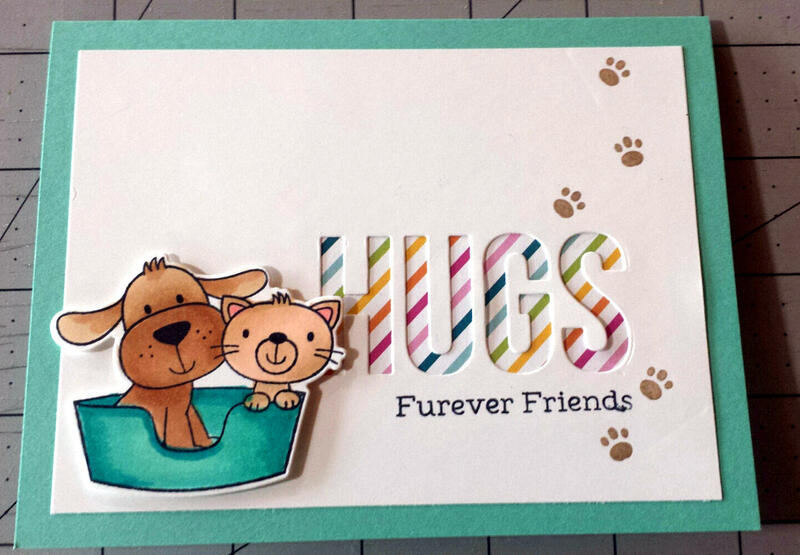 If you want to try some colour challenges, head on over to Splitcoaststampers!